This practice summarizes the results of the scientific paper "Integrating natural capital assessment and marine spatial planning: A case study in the Mediterranean sea" by F. Picone, E. Buonocore, R. D’Agostaro, S. Donati, R. Chemello, P.P. Franzese, published in Ecological Modelling 361 (2017) pp. 1–13. 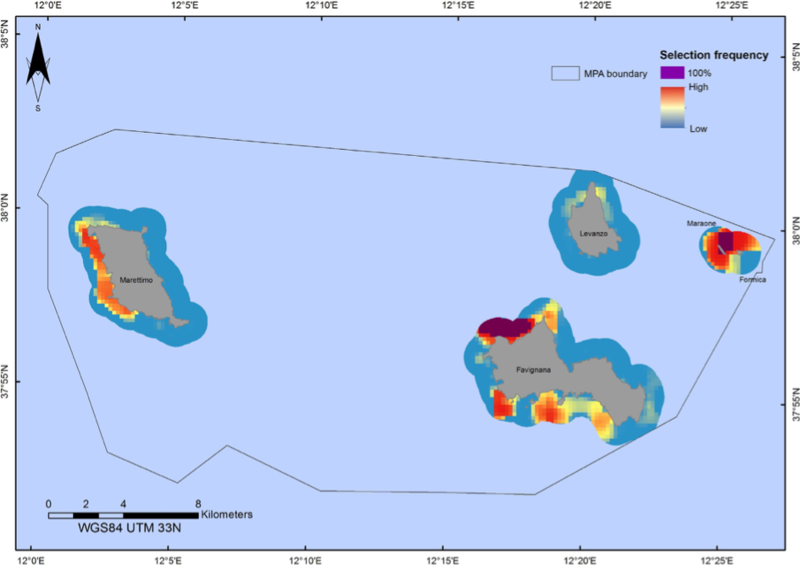 In this study, the biophysical and non-market monetary value of natural capital of the Egadi Islands MPA (South Italy) was assessed through the emergy accounting method. In addition, by using Marxan software, the results of the environmental accounting were integrated with spatial data on main human uses to identify key areas for natural capital conservation, taking into consideration the trade-offs between protection measures and human exploitation. For this integration, two different scenarios were considered, with and without accounting for human uses in the EI-MPA. The comparison between the scenarios highlighted the importance of taking into account human activities in marine spatial planning (MSP), allowing the identification of key areas for natural capital conservation. In conclusion, this study showed the importance of integrating environmental accounting with conservation planning to support effective strategies for ecological protection and sustainable management of human activities. How can conservation scenarios for MPAs be accounted for in MSP? 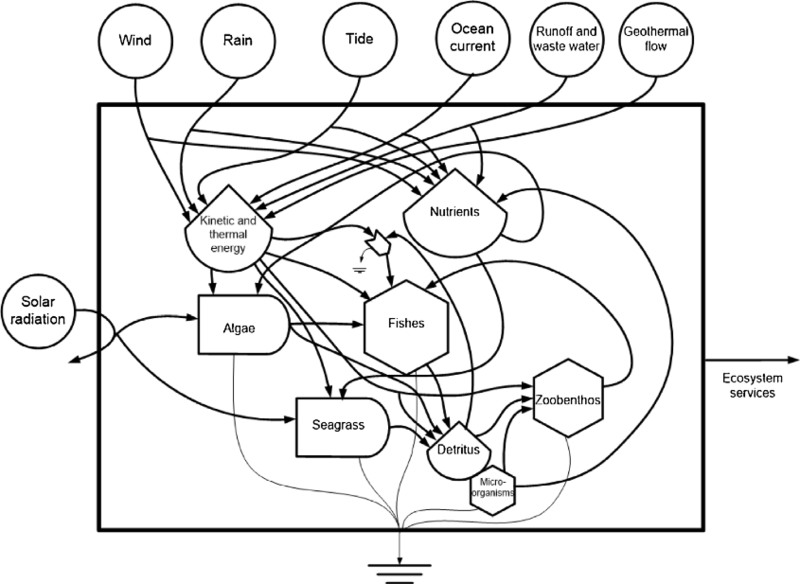 Are there experiences of accounting for biophysical value of natural capital in MPAs? In 2014, the Italian Ministry of the Environment and Protection of Land and Sea financed a 4-year research programme entitled “Environmental Accounting in Italian Marine Protected Areas” (EAMPA), based on the implementation of an environmental accounting system for all twenty-nine Italian MPAs. The purpose of the project was to carry out a biophysical and economic assessment of natural capital stocks and ecosystem services flows, while also considering the impacts generated by human activities taking place within the MPAs. The project also entailed the spatial representation of both the ecological and economic value of natural capital within the investigated MPAs to support marine spatial planning (MSP). Established in 1991 by the Italian Ministry of the Environment, the Egadi Islands MPA (hereafter EI-MPA) is located off the western coast of Sicily and surrounds three islands named Favignana, Levanzo, and Marettimo, and two islets named Maraone and Formica. The total area of the MPA is 53,992 ha; and with a coastline of 74 km the El-MPA is one of the largest marine reserves in Europe. The economy of the archipelago is mainly based on fishing and tourism. Professional fishing and the seasonal sea-based tourism are indeed the main economic driving forces. In particular, beach tourism, boat trips, restaurants and hotels benefit from the summer flow of tourists as well as the many diving centres authorized to operate in the MPA. The MPA has a high naturalistic value as it hosts important habitats such as coralligenous and vermetid reefs, and includes the largest Posidonia oceanica meadow in the Mediterranean, all listed in the European Red List of Habitats. The rich biodiversity associated with its habitats also comprises rare and threatened species, e.g. the Mediterranean monk seal, sea turtles, the dusky grouper, and the noble pen shell. The aim of this study was to define and implement a multi-criteria assessment framework to allow a broad and interdisciplinary approach to nature conservation and spatial planning. Specifically, integrating environmental accounting - performed under a donor-side perspective - with MSP was pursued. The emergy accounting method and Marxan software were selected among the available tools to assess the biophysical value of natural capital in the case study of the EI-MPA. In this way, nature’s value was included in spatial investigation processes. Moreover, the conversion of emergy values into non-market monetary units provided a tool useful to convey nature’s value to local managers and decision makers. Emergy Accounting (Odum 1988, 1996) is an environmental accounting method aimed at assessing the environmental performance and sustainability of processes and systems on the global scale of biosphere, taking into account free environmental inputs (e.g., solar radiation, wind, rain, and geothermal flows), human-driven flows as well as the indirect environmental support embodied in human labour and services. In this method, all inputs supporting a system are accounted for in terms of their solar emergy, defined as the total amount of solar available energy (exergy) directly or indirectly required to make a given product or support a given flow, and measured as solar equivalent Joules (sej) (Odum, 1996). Emergy accounting has been widely applied to explore the interplay of natural ecosystem and human activities. Economic conversion, expressing the biophysical value (emergy) of natural capital into non-market monetary units. The identification of important areas for the conservation of natural capital was carried out using Marxan (Ball and Possingham, 2000). Marxan is software programmed to solve “the minimum set problem”, a reserve design problem in which the aim is to achieve some minimum representation of “conservation features” (e.g., species, habitats) for the smallest possible cost through the selection among potential sites called “Planning Units” (PUs). The total emergy value of natural capital stocks in the EI-MPA was 1.12 × 1021sej, resulting in about 1.17 billion of euros. The integration of the calculated emergy density values into Marxan analysis allowed the incorporation of a biophysical assessment into MSP, providing an additional element for the generation of conservation scenarios. Furthermore, to avoid negative socioecological consequences, conservation scenarios were identified including the human component of the reserve system. The spatial analysis carried out using Marxan software and the comparison between the two scenarios generated with and without accounting for human activities showed the importance of considering human uses in MSP. By comparing obtained results with the current zonation of EI-MPA, it was possible to point out that some priority areas (with high selection frequency) are adequately protected (e.g. Marettimo). On the contrary, some areas indicated as priority by the applied method, are presently not sufficiently protected (Favignana island). Therefore, a new zonation could be developed to improve the marine reserve effectiveness. The outcomes of the study showed their relevance for policy making and management issues such as zonation and the development of conservation plans based on both ecological and socio-economic aspects. Finally, the conversion of the biophysical value of natural capital into monetary units facilitates the understanding of the results to policy makers. Nevertheless, it should be remarked that these non-market monetary values should not be interpreted like market prices adopting a user-side economic perspective. This study was based on the application of a standardized assessment protocol developed in the framework of a national project involving all twenty-nine Italian MPAs. For this reason, the potential for comparison of the present results is very high. The outcomes of the study represent a benchmark useful for comparative analysis with other Mediterranean MPAs. Ball, I.R., Possingham, H.P., 2000. Marxan (V1.8.2): Marine Reserve Design Using Spatially Explicit Annealing, a Manual. University of Queensland, Brisbane, Australia. Odum, H.T., 1988. Self-organization, transformity and information. Science 242,1132–1139.Odum, H.T., 1996. Environmental Accounting: Emergy and Environmental Decision Making. John Wiley and Sons, New York, 370pp. Odum, H.T., 1996. Environmental Accounting: Emergy and Environmental Decision Making. John Wiley and Sons, New York, 370pp. The study is part of the 4-years research programme “Environmental Accounting in Italian Marine Protected Areas” (EAMPA), funded by the Italian Ministry of the Environment and Protection of Land and Sea.